Without any doubt, a pudding without a custard is unheard of in the U.K. The two simply cannot exist without each other. Pudding and custard are just so, well, British. Custard is the perfect partner for British puddings and desserts and custard sauce, as it also is known, is so easy to make. With this recipe in your arsenal, you'll never need to buy jarred custard or a package mix again. Place the milk, cream, and 1 teaspoon of the sugar in a heavy-bottomed saucepan. Bring it to a gentle simmer and then turn the heat down to its lowest setting. In a large heatproof bowl, place the remaining sugar and egg yolks and whip by hand or with an electric mixer until light, creamy, and pale yellow in color. While whisking constantly, slowly pour the warmed milk and cream into the egg mixture. Strain the custard sauce through a fine sieve, pour back into the saucepan, and add the vanilla bean seeds. Over low heat, stir constantly until the custard starts to thicken. It is important you do not try to speed up this process by raising the heat because you run the risk of the sauce curdling, and even worse, burning. Once thickened, remove from the heat and pass through a sieve again. Your sauce is ready. Don't confuse custard sauce with pastry cream, also known as crème pâtissière. Pastry cream is much thicker and is used in making classic pastries; it is not a pouring sauce like custard. 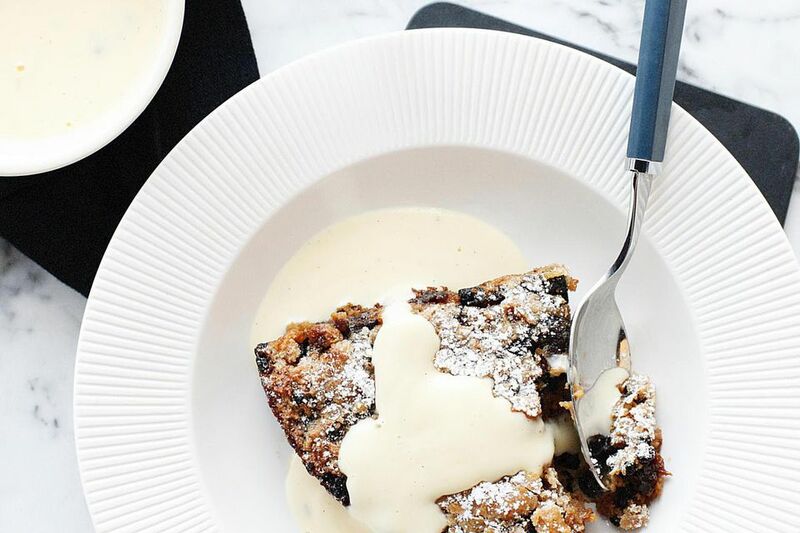 The classic custard comes into play at Christmas when it is teamed with traditional Christmas pudding. There are several sauces served with the pudding, but a brandy custard is always popular. Using this recipe, at the very end of cooking and after passing it through the sieve, stir in 6 tablespoons (or to taste) of good-quality brandy. It is not recommended to serve brandy sauce to children.